Every month Dayton hosts a First Friday event. While the specific activities change with the season, the fun and community spirit ties these events together. 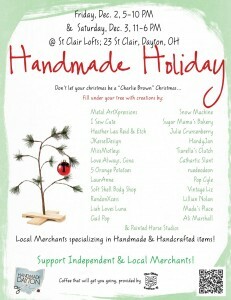 Tomorrow, December 2, 2011 First Friday and one of the unique options is the Handmade Holiday at the St. Clair Lofts, located at St. Clair Street at 4th Street (just north of the Neon and south of the Dayton Metro Library). The Handmade Holiday shop is open from 5 to 10pm Friday, and 11am to 6pm Saturday. Buy local. Keep your money here. Become supporter of Dayton’s vibrant arts community. For more details, visit DaytonMostMetro.com.